Nestled deep inside the middle of your brain rests the pineal gland. Descartes believed it to be the seat of the soul and scientists have found that it produces melatonin, which affects sleep patterns. In the metaphysical community, it is believed that the pineal gland in most people today is not activated or stimulated, due to too much electronic stimulation and fluoride in tap water and toothpaste. However, pineal gland activation is possible if you know how. But why should we care about pineal gland activation? What are the benefits of pineal gland activation? There are seven Chakras in our bodies and the pineal gland is the 6th one. All of the chakras should be balanced for the optimal performance of the body and the mind. Pineal gland activation will help the 6th Chakra reach its potential, which includes clairvoyance, psychic abilities, imagination, and dreaming. Pineal gland activation will awaken our minds ability for prophecy. A person who has achieved pineal gland activation will experience increased psychic awareness and psychic talents. Some people believe that supernatural powers will be initiated with pineal gland activation. 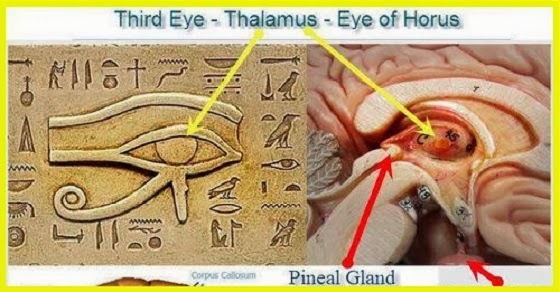 Besides increased psychic awareness, pineal gland activation will help the pineal gland, or the third eye, to act as a stargate that can see beyond space and time. It also acts as a link between the physical world and the spiritual world. That's not all. Other benefits of pineal gland activation include telepathy and a greater level of perceptiveness that can go beyond this three dimensional world. There are three crystals in the pineal gland which help with this ability of visionary capacity. The three crystals are apatitie, calcite, and magnetite. Apatitie helps with inspiration, spiritual oneness, and psychic enhancement, while calcite is for the expansion of powers. Magnetite aids with mediation, visionary purpose, and establishing our experiences in the physical world. Together, all these three crystals create a cosmic antennae, which aids the transfer of signals between the different dimensional planes. All these benefits have caused some people to believe that the most famous prophets of our history all have undergone pineal gland activation. If all these benefits sound like something you want to experience, the next step is to learn how to achieve pineal gland activation. The most important step in activating the pineal gland is to raise the frequency in the body. This can be done through meditation, visualization yoga, chanting, dancing, drum sounds, Tai Chi postures, Qigong positions, and using stereo grams. Any of these methods will open the third eye (the pineal gland) and help you to be able to see beyond the physical world. This process takes practice - with practice, you will be able to do this faster and more often. Producing certain sounds can activate your pineal gland. One method is to make the sound'nnnn' while covering your ears. Then sound 'mmm' for a few minutes, and then say 'ngngng' for the same amount of time. These sounds will put a light pressure on the pineal gland, which stimulates it and activates it. Stop ingesting fluoride: One of the substances that does a great job calcifying the pineal gland is fluoride (sodium fluoride). Fluoride is very harmful to the pineal gland because it disrupts the pineal gland’s natural functions by hardening its interior walls. Fluoride is also very toxic to the brain and other organs of the body. The name fluoride is a cover up term for many of the dangerous chemicals that make up fluoride, including arsenic, lead, aluminum, cadmium, fluorosilicic acid and even radioactive materials. If you live in the U.S., fluoride is commonly found in drinking water, fluoridated toothpaste and conventional produce. To effectively remove fluoride from drinking water, you will need to use a water purification system that has a special filter called activated alumina (AAL). The water purification system worth checking out is made by Berkey. Reverse osmosis water filter systems are also great at removing fluoride. As for toothpaste, only use fluoride-free toothpaste. Take an iodine supplement: Studies have shown that iodine supplement may help the body remove fluoride. The iodine supplement I recommend is NutrioDine because it is made of atomic iodine, a form of iodine that the body can easily utilize without the harmful effects of toxic buildups. I do not recommend taking potassium iodide because it can cause toxic buildups, especially if it is taken for long periods of time. For food, I recommend eating organic kelp because it is high in natural iodine. Eat organic food: Most foods that are not organic usually contain harmful synthetic chemicals and heavy metals. Many of these toxins are toxic to the pineal gland. To reduce the level of these toxins in your body, you will need to eat organic food. Organic foods are produce with strict guidelines; therefore, they are not suppose to contain harmful synthetic chemicals and genetically modified ingredients. The levels of nutrients in organic foods are usually higher than conventional foods. Many of these nutrients are essential for purging toxins from your body. Magnesium and calcium are two important nutrients for helping your body eliminate toxins, especially fluoride.